Although corporate earnings conference calls are important for investors to pay attention to, in terms of entertainment value they can be pretty dull affairs. A company’s executives will usually read prepared statements and give measured answers to analyst questions. When an executive goes off script, things can get interesting. On Wednesday afternoon, during Tesla‘s (NASDAQ: TSLA) call, co-founder and CEO Elon Musk became annoyed at some questions. He refused to answer and called the questions “boring,” “dry,” and “boneheaded.” He even said they were “killing” him. When an analyst mentioned that the CEO of Daimler (OTCMKTS: DDAIF) Dieter Zetsche said that the specs for Tesla’s semi-trucks (planned for production as early as 2019) do not obey the law of physics, Musk curtly dismissed Zetsche as not knowing physics. If you are wondering, Zetsche is indeed not a physicist, but he has a doctorate in electrical engineering and is one of the most respected persons in the auto industry. Daimler does not believe Tesla’s semis can have a range of 500 miles with current battery technology. On the other hand, Musk argues that Tesla would not need some sort of breakthrough for the planned semis to deliver on that promise. In any case, investors did not take Musk’s behavior well. Despite reporting better-than-expected revenue and loss, as of noon on Friday, the stock had dropped about 5% since the earnings call. Surely, not every CEO likes every Wall Street analyst they deal with, but they usually still maintain a professional demeanor during public interactions. Tesla has had some problems lately. The company failed to achieve the production goal for its Model 3 sedan, Tesla’s mainstream model. Planned production for its next model, Model Y, has also been pushed back to 2020. It has received some bad press from a recent fatal crash involving a driver who was using Tesla’s autopilot technology. And the company is burning through cash—it ended the first quarter with the lowest amount of cash on hand in 2 years. 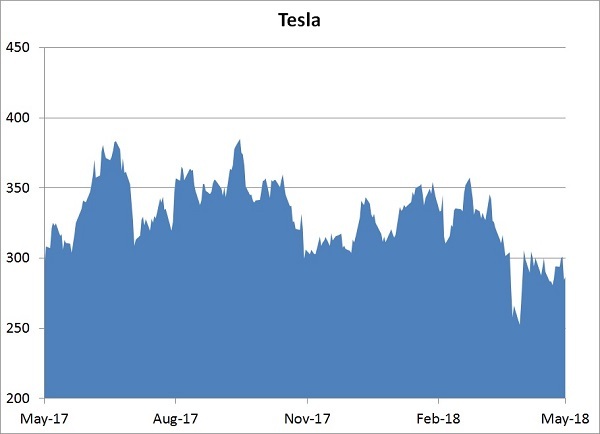 Demand for Tesla’s cars are strong, but since the company hasn’t been able to meet its production goal, it’s not selling enough cars so cash flow has been increasingly negative. Just Frustration, or Something More? Musk’s combative interaction with some of the analysts came across as frustrated and defensive, which had investors wondering if the company was in financial trouble and if he was cracking under the pressure and long working hours. (Besides Tesla, he’s also running SpaceX). There’s no doubt that Musk is a visionary, but his fit as a CEO to lead Tesla to profitability growth has come under question. Musk promises that Tesla will make money by the end of this year and says there’s no need to raise additional capital. However, the latest reported quarter was the sixth quarter of accelerating loss in a row. The production bottleneck is also a problem that needs to be resolved. Although Musk’s behavior was quite unprofessional, what really matters to investors is whether the company is truly in financial trouble and if his behavior was the symptom of a serious mental breakdown. If the answers turn out to be ‘no,’ the odd conference call will be just a blip in Tesla’s history. The odd CEO behavior certainly did not inspire investor confidence, but in the long run, what happens to the stock will depend on how the company fares. Can Tesla demonstrate a convincing path to sustainable profitability and growth? That’s the million-dollar question. During the conference call, Musk said that if people are worried about volatility, they should not buy Tesla stock. He’s right about that. A polarizing stock, TSLA will likely continue to have its ups and downs in a tug of war between bears and bulls. Plenty of people love the stock, but many also hate it. 38.3 million shares of TSLA have been sold short, representing almost one-third of the float. TSLA is definitely not a stock for conservative investors. More aggressive investors, though, may find the stock’s volatility attractive because there’s more opportunity to make sizeable quick gains, especially by using leverage, such as options.